You have worked hard to build a family life and achieve a level of comfort and security, only to face the harsh reality of separation and divorce - we are here to provide the legal counsel you need to get through it successfully. Led by respected, 20-year family law attorney Jill E. Burton, our dedicated legal team will help sort out the issues in your case, protect you against pitfalls, and help you form a plan to move forward with your life. We believe in straight talk, timely resolution whenever possible and fighting for what is right when settlement isn't a viable option. To arrange a consultation on your case, please contact us today. Strong Representation for Favorable Results and Fewer Regrets. 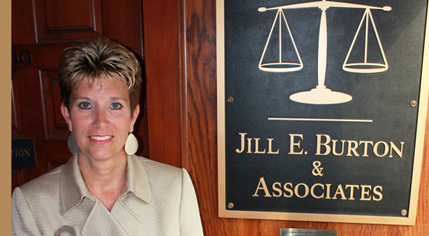 Jill E. Burton is a Board Certified Family Law Specialist known for her grasp of North Carolina law and strong, caring advocacy for clients. Our firm is an excellent choice for people who want to face facts, find the best legal approach and move forward toward resolution. If you have children, we understand that maintaining strong relationships with them is a primary concern, and we will work aggressively toward the custody and visitation arrangement that makes it happen. Another of our major strengths is the ability to handle complex marital and personal property division issues � including those requiring thorough asset and business valuations � pursuing the best possible financial outcome for you. We have handled many divorce cases involving business owners and leaders, highly compensated executives, and supportive spouses who have contributed greatly to the family's financial standing. For people with a lot at stake financially, we put in tremendous effort and all due diligence to protect their share. We also provide helpful, efficient legal services in happier times. If you are planning to marry and want to establish parameters in a prenuptial agreement, our lawyer, Jill E. Burton, has the specific knowledge and financial savvy to assist you. We also help people navigate the legal steps to complete stepparent adoptions. When you contact us, we can explore and assess several possible means of resolving your case, including mediation, collaborative law or arbitration. If litigation at trial is necessary to achieve your goals, you will want Jill E. Burton & Associates, P.L.L.C. on your side.